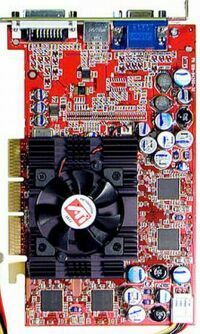 ....when I first read (HERE) that some Russian hardware crazies had moved a tiny resistor on a 128MB ATI Radeon 9500 card--the cheaper non-Pro version, no less--and made it run like a 9700. A hoax, I immediately thought. But as I surfed from one link about the story to another, it became clear that this was for real; these guys were really on to something! But how could this possibly work?? At first glance, it would seem an impossibility. Consider the published specs for the Radeon 9700/9500 series of video cards (table at right). The 9500 sits at the bottom on all these key characteristics. Sounds like an exercise in trying to make a silk purse from a sow's ear! Look closely at the 9700 Pro and 9500 cards. See the difference? Me either! And that apparent lack of any visible difference, particularly in the memory chip arrangement, got people thinking, as well. And sure enough, it turns out that the 9500 has the same 256-bit memory bus that the 9700 cards use. 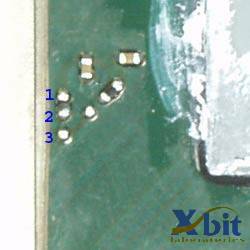 Look also at the memory chip arrangement on the 9500 Pro as a comparison--all together along one side of the board. 128-bit bus, as advertised. IMPORTANT NOTE ADDED 2/10/03!! Since this article was written, the situation with Radeon 9500 cards has CHANGED!! 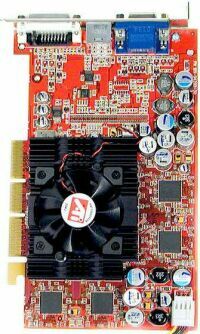 The early versions that used the Radeon 9700 card layout and were widely available in January 2003 when this story broke are disappearing quickly. 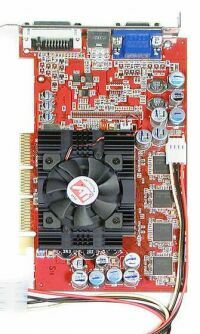 For example, two prime US sources for the Sapphire Atlantis Radeon 9500, NewEgg.com and Allstarshop.com, now show photos of these cards that are completely different than the one pictured above. The PCB (see it HERE) is now black, and--more importantly--the memory chip layout is now exactly like the 9500 Pro. This clearly indicates that these newer cards are no longer being built with the 256-bit memory bus. Hence, the modifications described in this article will not convert such cards into Radeon 9700 clones! Assuming that the GPU's still contain the 8 pixel pipelines with 4 of them disabled (and I have no direct knowledge if this is still true with these newer cards), the modification would turn them into a 9500 Pro. Not bad, but well off the 9700 performance standard. So if you are reading this article with the intent of purchasing a 128MB 9500 non-Pro card to try the modification on, it may already be too late. Such a card MUST be built with the 9700 card layout for the mod to work as described herein! LOOK CLOSELY BEFORE YOU BUY!! But surely the 9500 lacked four of the eight pixel pipelines present in the 9700 cards! ATI wouldn't waste their precious 8-pipe 9700 chips in the cheap 9500 card! That wouldn't make economic sense. Or would it? What could be the rationale for the 8-pipe chip to be used? Well, a couple come to mind. First of all, bringing a new chip into production is an expensive proposition. Even if the 8-pipe version is more expensive to produce on a per-piece basis, it would take a whole lot of chips to make up the cost incurred in introducing a new design into production. Also, one has to consider what happens when ATI makes a bad chip. Not a REALLY bad one, but one with, say, one bad pixel pipeline. You have to assume that ATI tests all these chips when they are produced, since some proportion of bad ones are inevitable in such a complex process, and it would be awfully expensive to just throw them all out. A chip with a bad pixel pipeline would be unfit for use in a 9700, but could make a perfectly good 9500, if the bad pipeline was one of four pipelines that could be DISABLED. This process of testing chips and then segregating them for use based upon the test results is widely used in the chip industry, and is known as "binning". Since the 9700 cards have been in production for a lot longer than the 9500, that could give ATI quite a while to accumulate GPU's with bad pipelines for use in the cheaper card. Just another reason why using the same chip in both types of cards could turn out to a more sensible course than it would seem to be, at first glance. Apparently, our Russian friends were curious about the possibility, too. 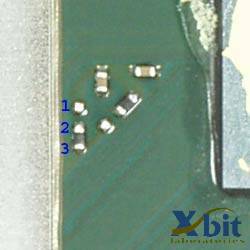 Upon very close examination of the 9700 and 9500 non-Pro cards, they noticed one interesting difference on the GPU's: a tiny surface-mounted resistor was in a different position on the two cards (photos at right, courtesy of the Xbits Labs site). On the 9700 cards, the resistor connects points 1 & 2, as shown in the photo on the left. On the right, you can see that resistor between point 2 & 3. What would happen if the resistor on a 9500 was moved to the position it occupies on a 9700 card? So that's exactly what the Russians did. And, lo and behold, when they fired it up and ran some benchmarks after the resistor modification and a 9700 BIOS flash, it ran like a 9700! The full 8 pixel pipelines were definitely operational. You can check their benchmarks at the link at the top of the page. 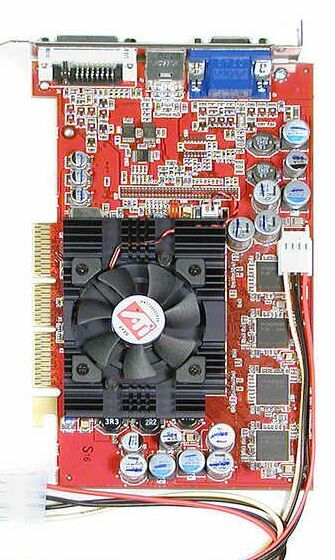 And you can find additional information and several relevant web links about this hardware mod at Graham Voce's "Radeon 9500 to 9700 Modding FAQ", HERE. As cool as this development was, it was of little more than curiosity value for many of us. That's because a very few people will feel comfortable with trying to remove and resolder a tiny resistor on a video card. And needless to say, if you screw it up, you can forget about your warranty. This hardware hack was simply beyond the capabilities or confidence of most of us. But that didn't slow several people down. Within a couple of days, reports surfaced that it wasn't even necessary to move the resistor. Merely shorting the 1 & 2 pins with the resistor left in it's original position would do the job. People reported using a solder bead or conductive glues & paints for this purpose. As these resourceful individuals dug into the situation further, it became evident that function of the resistor position was merely to determine how the card was identified by the drivers. So if this could be done with a hardware mod, could it be done in a different way with a software hack? ?